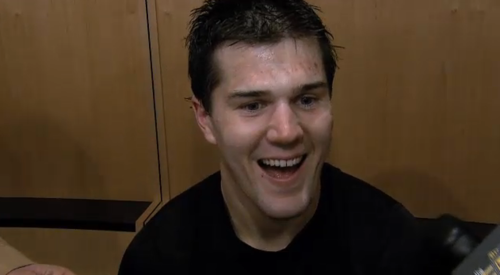 Last week, the Pittsburgh Penguins traded defenseman Ben Lovejoy to the Anaheim Ducks. I had the chance to speak with Ben before the Ducks faced off with the Detroit Red Wings last night. Q: How’s your game been with Anaheim so far after you’ve played a couple games with them already? A: It’s been fun. It’s a fun team to be a part of. We play hard. We play fast. We’re out there expecting to win these days. Q: Do you think your team has the right combination of veteran presence and younger players? A: Definitely. I think we have the perfect mix. I think we have a lot of young guys, who are energetic and fast, and I think they’ve pushed the more veteran players to play that style too. So far it’s been fun to watch and fun to be a part of. Q: How does this Ducks team compare to the Penguins team you just came from? A: I think it’s pretty similar. Both teams start with their high-end top two lines. You see guys on this team …Teemu Selanne’s on our second line. Bobby Ryan’s on our second line. I think we’re (Anaheim and Detroit) two of the only teams that can boast that high end skill level on their top two lines, and I think that both teams’ games are predicated on speed. Q: What does that say about your team’s depth. [Saku] Koivu’s had a great start this year, and he’s on the third line playing with [Daniel] Winnik and [Andrew] Cogliano? A: That’s a pretty good combination. Most teams would love to have a guy like [Koivu] playing on their lower lines. It has been fun to watch, and that third line has been not just an energy line, but a production line for us to start the year. Even our fourth line, we’ve got Nick Bonino, who’s been one of the hottest players in the NHL the last couple weeks, centering that line. Q: Do you think one of the key ideas is to give more equal ice time to all four lines? A: That’s been one of the coolest things about being in Anaheim. Bruce [Coach Boudreau] has rolled four lines and three sets of [defensemen]. I think that has helped us overcome…since I’ve been here we haven’t had the best first periods. We played well against Chicago in the first, but the other two games…Just the fact that we’re rolling four lines is so hard to play against. We’re a team that has that skill, but for our big guns to be flying in the third period, I think that’s a huge asset to this team. Q: Do you think that eliminates the fatigue factor when it comes to the third period? A: I definitely think that. Our top two lines have been able to take over third periods, overtimes, and shootouts. I think that Bruce rolling those lines and keeping those guys fresh for the end, not only helps them, but it helps your third and fourth line, and your third D-pairing stay in the game mentally and be ready to go when needed down the stretch too. Q: Have you meshed well with Bruce so far? A: So far so good. Q: Who have you kept close relationships with in Pittsburgh. A: I was there for six years. I’m pretty close with everyone. I will miss a lot of people that are there. I spoke to [defenseman Brooks] Orpik on the phone yesterday. I still text regularly. I’ll certainly miss them, but I’m excited to be in Anaheim.